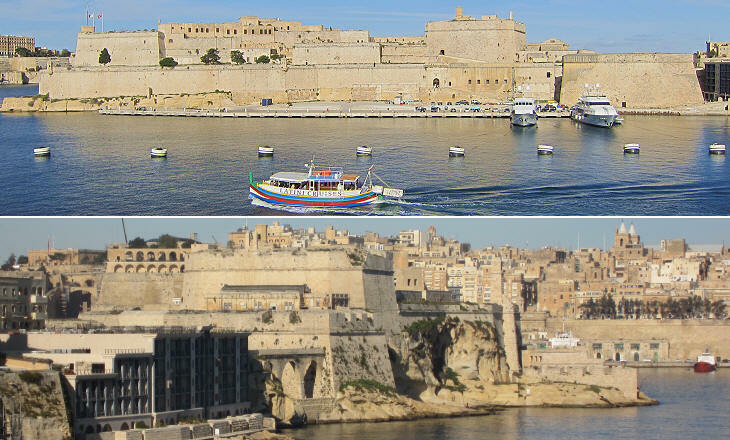 Malta has an excellent natural harbour on its eastern coast, yet it does not appear it was much utilized in antiquity. The Normans, after having conquered the island at the end of the XIth century, chose a section of this harbour as the local end of a maritime route they established between Syracuse, in southern Sicily, and Malta. 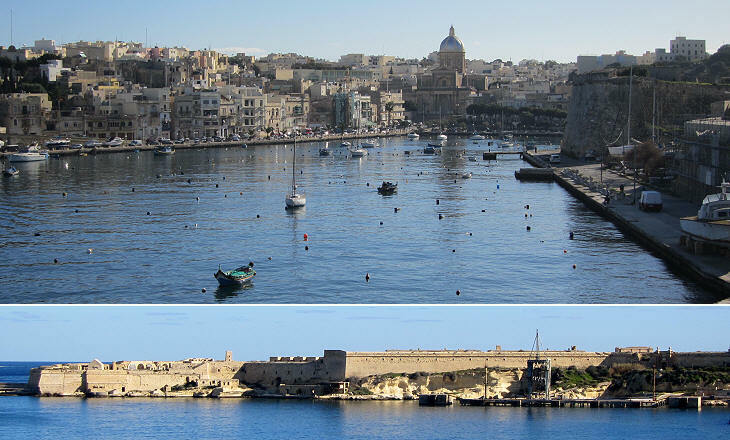 The natural harbour is divided into two sections by a peninsula (that where Valletta stands today); the southern section in turn is divided into three smaller inlets by two other peninsulas. The Normans and after them the Aragonese built some facilities for landing and eventually a small town on one of these two peninsulas. The site was known as Borgo or Burgo, an Italian word indicating a settlement outside the walls of a town, in this case a reference to Città Notabile (today's Mdina), the capital of the island which was located inland and was a walled town. Walls were eventually built at the beginning of Borgo peninsula while a small castle (Fort S. Angelo) protected its tip and was the residence of the governor of the town. In 1530 Emperor Charles V assigned the County of Malta, which was part of the Kingdom of Sicily, to the Knights Hospitallers or of St. John. In addition he gave the Knights Tripoli, on the coast of today's Libya. The Knights were best known as the Knights of Rhodes, because after having been expelled from the Holy Land at the end of the XIIIth century, they became the rulers of Rhodes and some other nearby islands. In 1522 they were forced to surrender Rhodes to the Ottomans after a long siege. 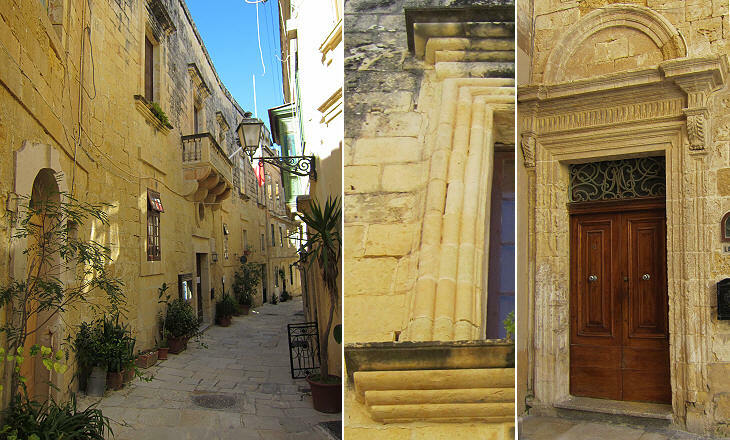 Once in Malta the Knights immediately decided that Borgo was a more appropriate location for them, than Città Notabile (Mdina). One of the first things they did at Borgo was to place the holy images which they carried from Rhodes inside chapels of new or existing churches. Philippe Villiers de L'Isle Adam, Grand Master of the Order, accepted the offer of Emperor Charles V with reluctance and only as a temporary base from which he hoped to reconquer Rhodes. Eventually these hopes were dashed by the growing Ottoman power at sea and auberges, hostels where the knights of each tongue (country) lodged or just met, were built in a quarter of Borgo called Collachio, which existed also at Rhodes and was reserved to the Knights. The size and decoration of the auberges, when compared to those of Rhodes, show the difficulties the Knights faced at the beginning of their Maltese experience. Rather than reconquering Rhodes, in 1551 the Knights lost Tripoli. Gozo, the second largest of the Maltese Islands, was raided by Ottoman corsairs; its citadel surrendered and the entire population of the island was taken into slavery. In that same year the Ottomans laid siege to Borgo for a few days. 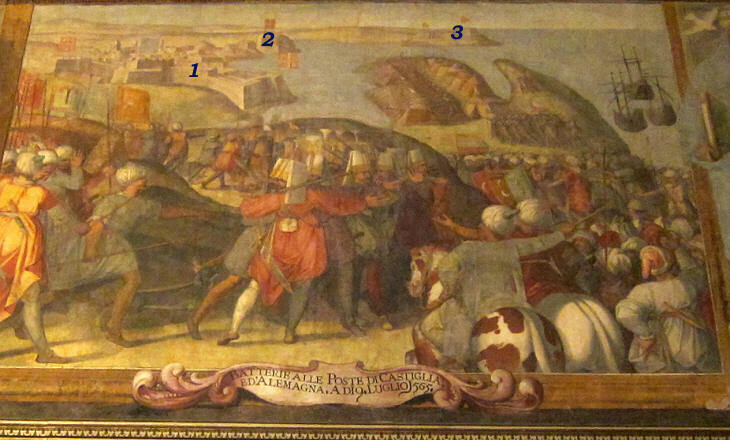 At this point Grand Master Claude de la Sengle and after him Jean Parisot de Valette realized that the Knights' possession of Malta was at risk and they: a) improved the fortifications of Borgo with new high bastions; b) fortified Isola, the peninsula opposite Borgo, which was renamed Senglea; c) closed with a chain the entrance to the harbour and d) turned an existing watchtower at the tip of the main peninsula into a small fortress (Fort S. Elmo). In 1565 the effectiveness of these fortifications were tested because a large Ottoman army landed on the southern part of Malta and made their way to lay siege to Borgo. The defence of the walls of Borgo was assigned to the various tongues and so Castile Bastion's defence was assigned to the knights of that tongue. The fortifications of Borgo were modified after the siege, but not so much at the Castile Bastion where the crucial event of the siege occurred. The Ottomans managed to reach the top of of the bastion and almost seized it. 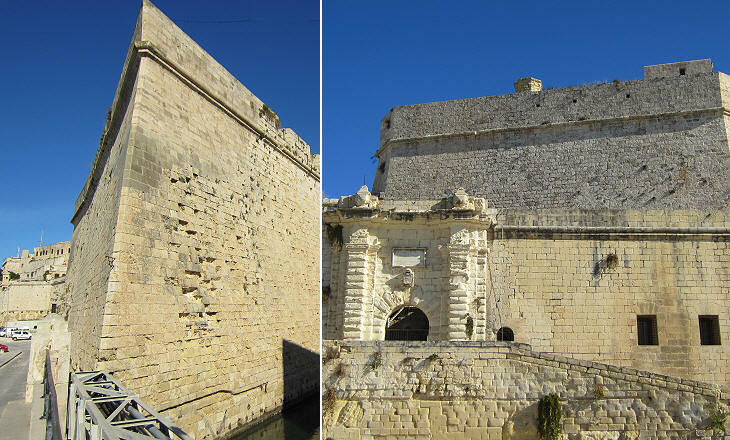 Grand Master Valette left his residence in Fort S. Angelo and personally led the counter-attack of the Knights. The Ottomans were forced to retreat. At one point representatives of each tongue discussed with Valette the option of retreating from Borgo and concentrating their forces inside Fort S. Angelo. The Knights had dug a canal between the fortress and the town so it would have been difficult for the Ottomans to climb up its imposing angled bastions. Valette however preferred to hold onto the walls of Borgo as he felt the Ottomans were starting to run out of time. 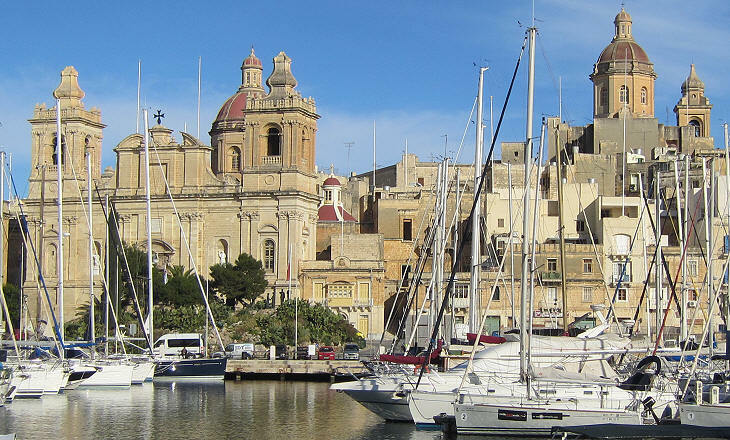 As a matter of fact they did not intensify their attacks and instead they tried to seize Città Notabile (Mdina) to use it as their winter camp. This attack also failed and in September, after Spanish troops landed on the northern part of the island, the Ottomans lifted the siege to Borgo and left Malta. The victory had an impact on relations between the Knights and Malta; they no longer felt themselves to be in exile from Rhodes and Grand Master Valette decided that the Order needed a new see in recognition of the status acquired by defeating the Ottomans (which caused an increase in donations by European benefactors). He decided to build a new town on the main peninsula of the great harbour. It was named after him La Valetta (today Valletta). 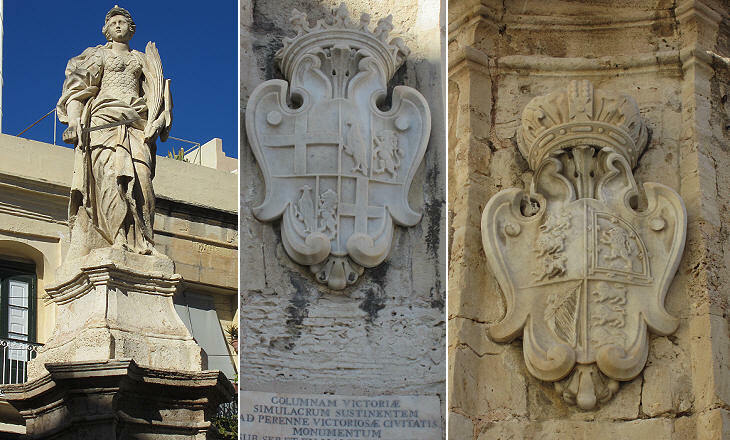 Borgo was renamed Città Vittoriosa and in 1705 a monument was erected to celebrate the 1565 victory, but the town lost its political role. At Rhodes Mandrachio (Gr. Mandraki) designated a small harbour where the Knights kept their warships; a similar name was given to the inlet on the other side of Borgo. The Knights had a small, but very active fleet. This harbour was relatively unprotected until Fort Ricasoli was built in 1670-93 opposite Fort S. Elmo. The construction was financed by Fra Giovanni Francesco Ricasoli; the Knights used to call themselves Fra(tello) (Brother) because of their religious vows. The Ricasoli are a noble Florentine family, today best known for their Chianti vineyards. 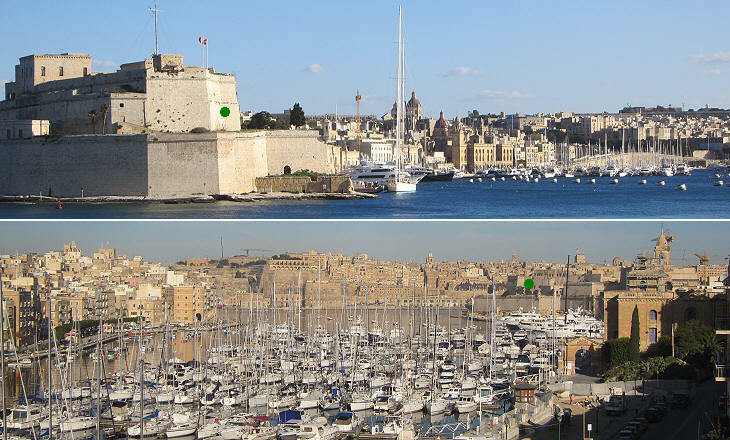 During British rule Fort S. Angelo became a key facility of the Royal Navy, although the main harbour with its shipyard was moved behind Senglea. In 1912 it became the headquarters of the local British Admiral and the fort was renamed HMS Egremont and in 1933 HMS St. Angelo and a mast was erected on its highest terrace. In January 2012 the fortress was closed for maintenance. There is a risk that, similar to other historical sites of Malta, the fortress which withstood Ottoman attacks might fall to more cunning assailants: real estate developers. In 1530 when the Knights settled in Borgo they utilized an existing church dedicated to St. Lawrence as their conventual church. 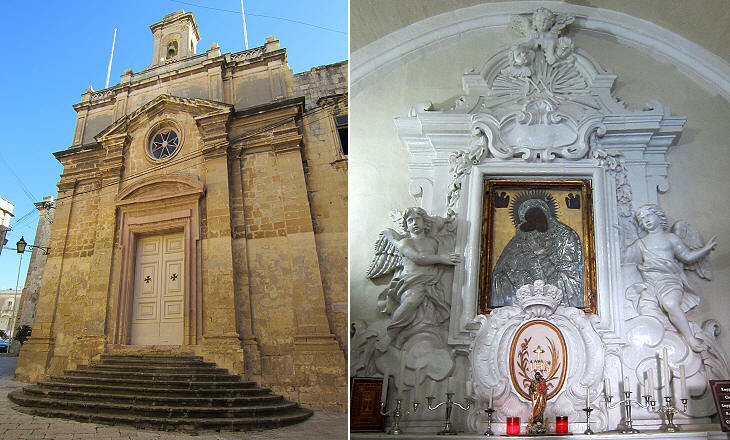 In 1574, after having relocated to Valletta, they gave it to the Inquisition, the special tribunal of the Roman Catholic Church which had opened a branch in Borgo. The church was entirely rebuilt in 1681-97 (the bell towers were completed at a much later time). The Church of the Annunciation was built by the Dominicans a few years before St. Lawrence was rebuilt; this church was badly damaged during WWII. The new church of St. Lawrence was designed by Lawrence Gafà, younger brother of Melchiorre Gafà (Ital. Caffà), a talented sculptor and a member of Gian Lorenzo Bernini's inner circle. 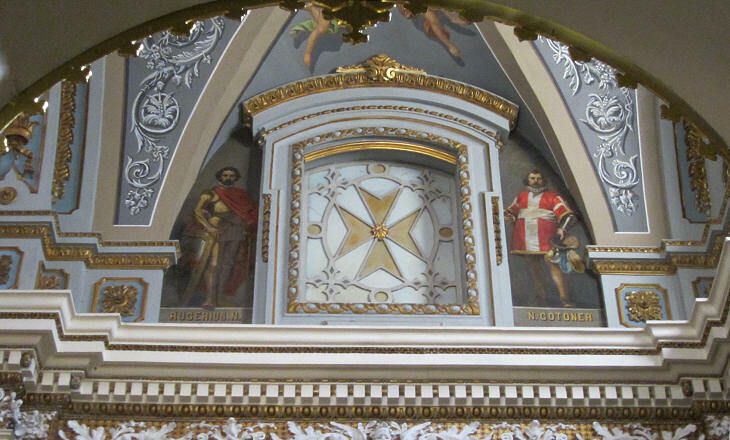 The design of the interior, as well as some of the monuments which decorate it, show the close artistic ties which existed between Malta and Rome. This topic is dealt with in more detail in a separate page. The main nave was decorated with portraits of some of the Grand Masters and with that of Roger I, the Norman knight who with his brother Robert Guiscard conquered Sicily and eventually landed on Malta. His portrait inside the church is due to the fact that he freed the Christian slaves who lived on the island. Nicolas Cotoner was Grand Master between 1663 and 1680; he strengthened the fortifications of Vittoriosa by building new imposing walls which are named after him (Cottonera Lines). 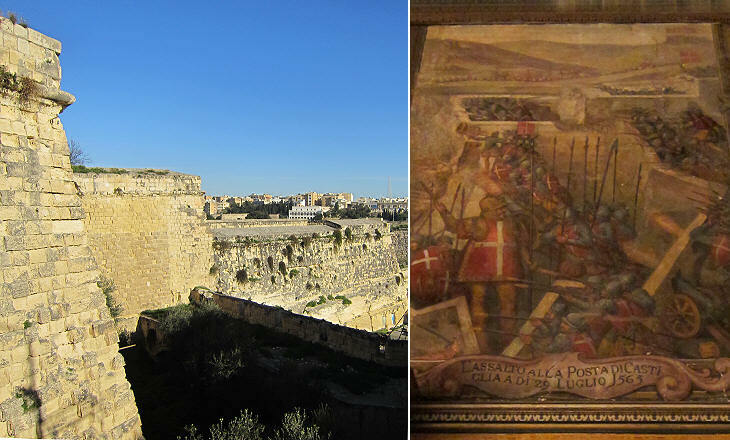 From an administrative viewpoint the walls are in part in the territory of Birgu (the Maltese name of Borgo/Città Vittoriosa) and in part in that of neighbouring Bormla (Città Cospicua) and they are covered in the page covering that town. 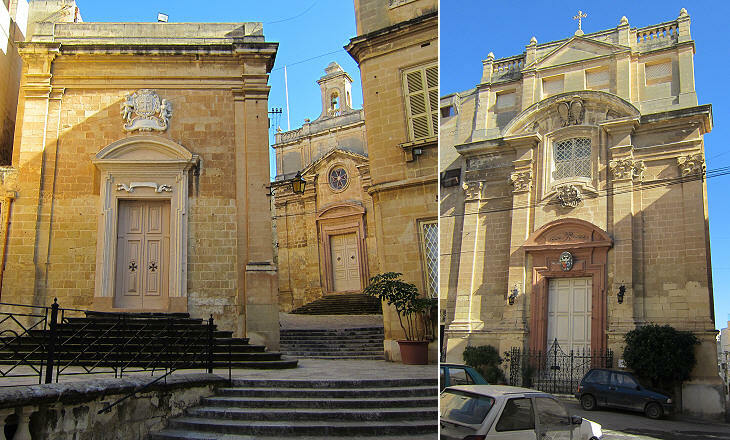 Malta can compete with Rome on the number of religious buildings per square mile. 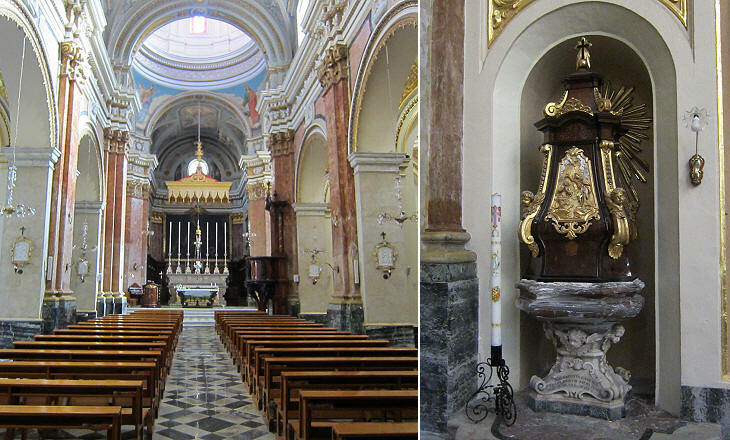 The Oratory of the Holy Crucifix was built in 1720 by the brotherhood by the same name. It stands above the mass graves where the defenders who fell during the 1565 siege were buried. St. Scholastica's is the church of a convent of Benedictine nuns which is lodged in the hospital which the Knights built soon after their arrival to comply with their obligation of housing and helping pilgrims. The church was designed by Lorenzo Gafà in 1679. 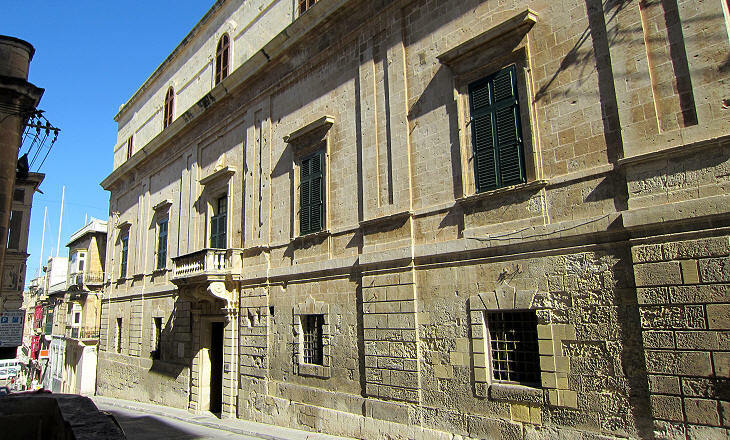 The Bishops of Malta resided at Città Notabile (Mdina), but when the Knights settled in Borgo they built a second residence in this town; after the Knights relocated to Valletta for many years the Bishop's secondary residence remained at Borgo; eventually in 1624 a palace was completed at Valletta. The Inquisition instead did not move; the Inquisitor lived in a palace (with an underground jail) rebuilt in 1660. Fabio Chigi, who was elected Pope Alexander VII in 1655, was Inquisitor in Malta for five years. The image used as background for this page shows the decoration of a window near Fort S. Angelo.